ABC has announced when its revival of the beloved '90s sitcom will debut — and it's released an all-new cast photo. Emotionally, our countdown to the "Roseanne" revival began the moment we found out it was happening. But now, it can really begin. Folks, we have a premiere date! ABC has announced the all-new season of the popular '90s sitcom will begin at 8 p.m. EDT on Tuesday, March 27 — for a full hour! In subsequent weeks, the show will keep the Tuesday 8 p.m. time slot, but episodes will last for 30 minutes. "Featuring the complete original cast, new series regulars and notable returning guest stars, the revival will explore life, death and everything in between through the relatable, hilarious and brutally honest lens of the Conner household," a press release from ABC read. "With the inimitable Roseanne at its epicenter, fresh stories that tackle today’s issues and even more laughs from a brilliant cast and crew that haven’t missed a beat, audiences old and new will celebrate the homecoming of America’s favorite working-class family." 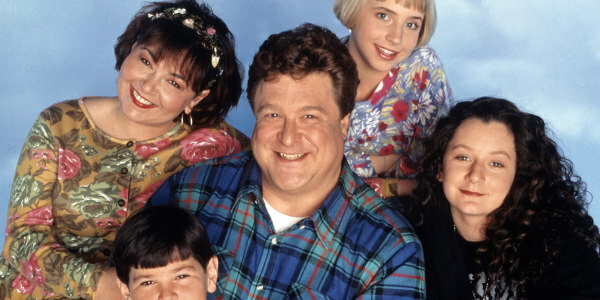 About that all-star cast, pictured above in a new promotional photo — the lineup includes Roseanne Barr as Roseanne Conner, John Goodman as Dan Conner, Laurie Metcalf as Jackie Harris, Lecy Goranson as Becky Conner-Healy, Sara Gilbert as Darlene Conner and Michael Fishman as D.J. Conner. Sarah Chalke, who played the character Becky in later seasons, will also appear in another role. So, great, you can officially start planning your premiere party. Just remember to always order more pizza than you think.